Marty Wilde, British rock pioneer, has spent 13 years shunning the record studio... until now. Not that he has been a stranger to the record world, particularly with his involvement in the successful launch of daughter Kim as a topseller. But hen anyone tentatively suggested that Wilde himself should stand in front of a studio microphone, they were greeted with massive indifference. He told me, "I was bored to tears with the sound of my own voice." Despite offers from around the world, Wilde's self-imposed exile seemed permanent. "It didn't apply to stage work. I love the road and I play on stage at least once a week - but records, no. I could never see myself recording again", he said. It was old friend Peter Dulay, the man behind top TV shows like Candid Camera, who recently helped change his mind. He said, Cliff Richard and I stumble across each other every year or so, for instance. I love these get-togethers, rtalking over the old times. There's a kind of camaraderie." But, aside from the nostalgia scene, Wilde's life has been changing in the past few years. He began to concentrate more seriously on songwriting and he was a guiding influence on the careers of his children Kim and Ricky. "Kim didn't really need my help", he said modestly, failing to point out that he co-writes all her material with Ricky. "She just gets on with it in her own way." Ricky was another matter. Wilde said: 'Ricky left school a reasonable keyboard player, and since jobs for teenagers were so scarce, I offered him a place in my band. I thought he had potential. A good pianist can always earn a living. I told him to work hard and he did. He began to spark me off in return and I encouraged him into songwriting." Perhaps it was this burst of enthusiasm which helped persuade Wilde to listen seriously to the latest suggestion about making records on his own account once more. He said: "I'd always loved the sound of those first Donna Summer tracks, that full, rich, synthy sound. So I met Peter Bellote, listened to the backing track he'd already laid down and was knocked out." The track was a rich background for a new version of the old Roy Orbison hit In Dreams and, within weeks, Marty was in Munich, adding the vocals. 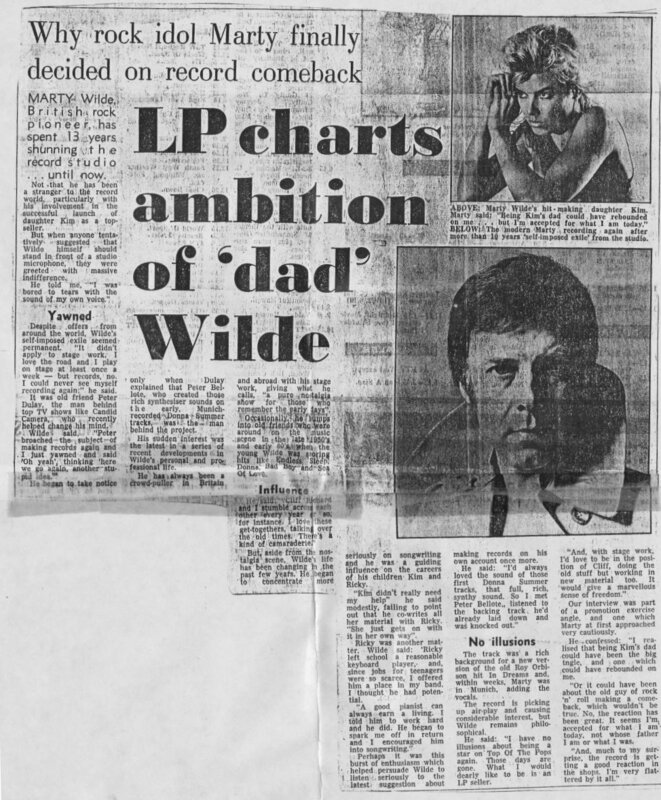 The record is picking up airplay and causing considerable interest, but Wilde remains philosophical. He said: "I have no illusions about being a star on Top Of The Pops again. Those days are gone. What I would dearly like to be is an LP seller. And, with stage work, I'd love to be in the position of Cliff, doing the old stuff but working in new material too. It would give a marvellous sense of freedom." Our interview was part of a promotion exercise angle, and one which Marty at first approached very cautiously. He confessed: "I realised that being Kim's dad could have been the big angle, and one which could have rebounded on me. Or t could have been about the old guy of rock 'n' roll making a comeback, whcih wouldn't be true. No, the reaction has been great. It seems I'm accepted for what I am today, not whose father I am or what I was. And, much to my surprise, the record is getting a good reaction in the shops. I'm very flattered by it all."